nformation for accuracy and consistency with the manuscript's text. The journal charges for Publication / processing fee of articles at the time of submission/Publication. 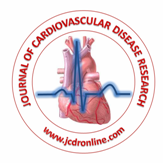 Journal of Cardiovascular Disease Research. c/o Medknow Publications and Media Pvt. Ltd. B-9, Kanara Business Centre, Off Link Road, Ghatkopar (E), Mumbai - 400075, INDIA.